The day I got my Elswick Tour Anglais was one of the most amazing of my life. 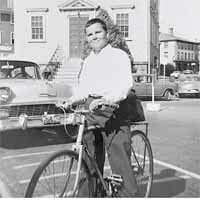 In 1959, "sporty" bikes were exceedingly rare in the U.S. If you had a bike with drop handlebars, even if it was just a hopped-up 3-speed, and saw somebody riding along the other way also with drop handlebars, there was absolutely no question but that you would both stop and chat for a few minutes. "Serious" cyclists were an infinitesimal minority. One day, Charlie Learoyd, a classmate of mine who lived across the street, appeared with a brand new bike that was the most amazing I had ever seen, an Elswick Tour Anglais. It was green with a white head tube and a white panel on the seat tube. It had 27 inch (630 mm) wheels (steel Dunlop Endrick rims), Dunlop White Sprite tires, aluminium drop handlebars, GB brakes, a startlingly skinny leather Lycett Swallow saddle (which was actually very comfortable) and a 4-speed Sturmey-Archer FW hub. Charlie let me try it out, it was sooooooooo fast and cool! 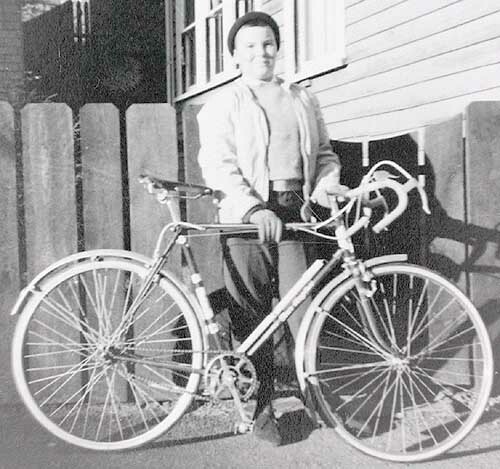 This bike sold for $80, a lot of money for a bike back then, and was available in two versions: the Sturmey-Archer 4-speed, or as an 8-speed derailer model with Benelux Mark VII derailers. 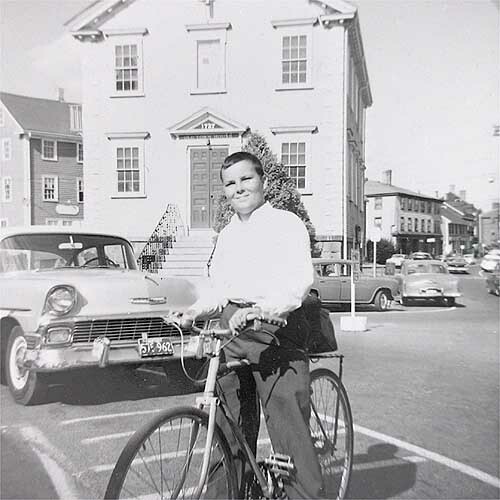 After a week, Charlie decided that he had made a mistake in opting for the 4-speed version--he took it back to Boston Cycle Mart in Lynn, and traded it for the 8-speed model. My father had died 6 years before, and my mother was eking out a skimpy living as an antique dealer. The idea of a new bike of any sort was unimaginable. Maybe my mother had just made a good sale on some antique item or something, or maybe she was motivated by a recent incident in which I had been attacked by a bully who was able to catch me on foot while I was on my bike, but, miraculously, she took me to Boston Cycle Mart, where the week-old green Tour Anglais was available for $50. She bought it! It was one of the most memorable and unexpected things that ever happened to me; I have never had so much joy from the acquisition of a physical object as I did from that bike. It seemed like a miracle. Of course, I was still a tinkerer...so 4-speeds wasn't enough for me, either. I rode in to the Bicycle Exchange in Cambridge, and bought a Cyclo 3-sprocket conversion kit which I installed it on the Sturmey-Archer hub, with a Benelux Mark VIII derailer. 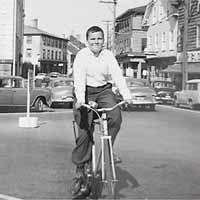 I had a twelve speed bike, at a time when 10-speeds were virtually unknown! The Elswick Lincoln Imp was a fancier model. A couple of years later, I had the oportunity to buy one myself used, for about $35, if I recall correctly. This model was a 4-speed with a Benelux Mark VII derailer, with GB "Forged Hiduminium" bars, stem, and sidepull brakes, Dunlop Special Lightweight rims and HPRR (High Pressure Road Racing) tires, (state-of-the-art clinchers of the day) Presta valves, a Williams crankset, genuine Brooks Swallow saddle, and Reynolds 531 frame tubes. It had nifty aluminum Resilion high-flange hubs with GB wing nuts, and the rear was reversible so that you could either have it set up with a derailer or as a fixed gear by flipping the wheel around, which I often did. It was my first fixed-gear bike, and I liked it a lot. I lent it to a friend, who left it out, and it was stolen. 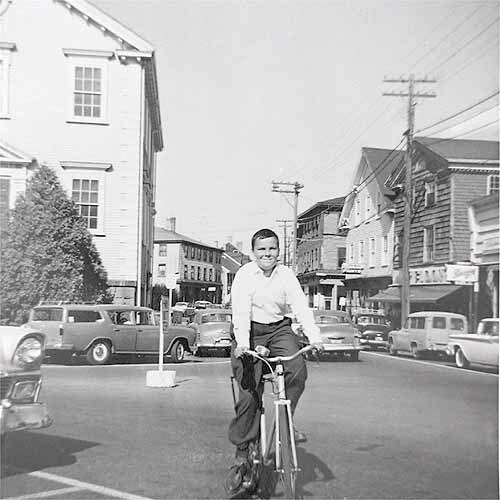 It probably wound up at the bottom of Marblehead harbor, since it was too distinctive to ride "hot". For a while, this was set up as a 24-speed, with a Sturmey-Archer AG 3-speed hub (with built-in Dynohub generator), a 4-speed freewheel, and a double chainwheel. The double chainwheel was quite a chore; the bike had come with a 48 tooth Williams chainwheel which was drilled to accept another chainwheel next to it, but the add-on chainwheels were not avaialable in the U.S. I found a child's bike that had a 40 tooth chainwheel, sawed the chainwheel off of its crank, drilled 3 holes to match the Williams pattern, and bolted it on. Then I discovered that the 3/32" chain wouldn't fit on the small chainring, because it was made for the thicker 1/8" chain. That didn't stop me, though: a couple of hours with a file and the extra 1/32" was gone. 24 speeds in 1962, that was a lot! It was geared with gain ratios from 1.88 (25"/2 meters) to 9.14 (123"/9.87 meters), or something like that. This was the most gorgeous-looking bike I have ever owned. It was a two-tone set up, most of the frame was a deep metallic burgundy color that glowed in the afternoon sun. The contrast color was like that of pistacio ice cream, or perhaps a lighter version of Bianchi's celeste. This color was used for the head tube, a wide panel on the seat tube, the brake cables, handlebar tape, Bluemels plastic mudguards (fenders) and pump. You cannot imagine how good looking this bike was..., how sad I was the day the irreplaceable Bluemels pistacio pump exploded in my hands, but I never had quite the emotional attachment to it that I had to the Tour Anglais. I have seen very few other Elswicks. They were not a large company, and I doubt that they survived long into the '60's, but I will always have a soft spot in my heart for them, and an eye peeled for my 23" green Tour Anglais. A colleague at work referred me to your web page about Elswick cycles. As you conclude that article by saying that you doubt whether Elswick survived long into the 60's, I thought you might like to hear what happened to Elswick. My involvement with Elswick was from 1984 to 1994 when I was C.E.O. of Elswick Hopper PLC, a British company quoted on the London Stock Exchange since 1936, and renamed Elswick PLC during the 80's. Elswick Cycles was owned by Elswick Hopper PLC, which in 1984 owned a number of businesses in engineering and distribution, the only thing all the businesses had in common was none of them made any money! Hence my arrival on the scene to sort things out. The bicycle part of the group went back to the 1880's when Fred Hopper started his cycle company in Barton-On Humber. He merged it in the 1890's or early 1900's with the Elswick Cycle Company, which took its name from Elswick, a suburb of Newcastle-on-Tyne. The cycle businesses were merged in Barton-On-Humber, where they were a major manufacturer before the first world war, exporting all over the world. As the business expanded, Fred Hopper built more factory units on the main site in Barton and in the town, so that when I joined Elswick in 1984 it had a largely derelict site with lots of decaying buildings. The production had been moved to nearby Brigg, into a single more modern factory. In the 70's (I think) the Falcon Cycle company was bought and for a while the two businesses were kept separate and ran as competitors. Eventually it was decided to merge them onto the Brigg site but to keep the two brands. This didn't work as the cycles were being sold through dealers with rival dealers in a town selling the rival brands, when they merged the dealers stopped buying both! Consequently around the time I joined it was decided to concentrate on the Falcon brand which was well known in the UK for sports cycles, which were selling well, whereas Elswick was better known for tourers, which were in decline. So that marked the end of sales of cycles under the Elswick name, though the company continued as Falcon Cycles. I bought the Holdsworth and Claud Butler names and these were used on the top of the range cycles, but the company wasn't successful after about 1987 as cheap imports were flooding the market from places like China. The local components industry had disappeared, so we had to import all the parts (we made the frames from Reynolds tubing) so we were caught trying to be a volume producer but too small at 120,000 cycles per annum. Meanwhile I had been rebuilding the Elswick group as a printing and packaging business focussed on self adhesive labels and garment labels, and the time came to sell the cycles business, which went to a company called Casket who had a largely import brand, Townsend (if I remember correctly). They did quite well and Falcon gained from their much greater buying power, until they bought a German bicycle maker, ran into major problems and nearly went bust, and were sold to a company called Tandem PLC, who last I heard were being taken over a by a group of investors planning to sell off the cycles and concentrate on racecourses (horses). However at present there are still Falcon, Claud Butler and Holdsworth cycles being produced. Elswick PLC was itself taken over in 1994 by a larger print and packaging group and has been swallowed up inside it. Anyway that's a short potted history, hope it is of interest. At Elswick PLC I used to have a really nice old poster, a woman in a long dress riding a bicycle under the caption "Ride in style on an effortless Elswick Price 20 Guineas"
See also the Classic Rendezvous Elswick/Hopper page.